Pour Le Monde, a natural fragrance brand emphasizing awareness and support for charity, debuted last year with three fragrances: Envision, Together and Empower. Envision ~ Smooth and seductive. Daring and exotic. ENVISION is simply intoxicating. A decadent natural perfume, this lavender based fragrance has top notes blended with Italian bergamot and pink peppercorn; touches of Brazilian orange and Persian lime. The aromatic base notes of patchouli, mixed woods and pure Madagascar vanilla make ENVISION irresistibly sensual…and incredibly all natural." 10% of the net sale benefits the National Multiple Sclerosis Society. Together ~ "Elegant and graceful. Flirtatious yet demure. TOGETHER natural perfume is delicately soft spoken while being thoroughly impressionable. Its top subtle fruity nuances are weaved into an exquisite bouquet of freesia, jasmine and violet isolates with an alluring combination of woodsy back notes. A natural fragrance for day or night, TOGETHER brings a harmonious contrast between classic and modern and is incredibly all natural." 10% of the net sale benefits the Cancer Support Community. Empower ~ "Fresh and Spirited. Playful and energizing. EMPOWER natural perfume is deliciously invigorating. Empower is a crisp, sparkling citrus perfume with top notes of grapefruit, lemon, and mandarin interspersed with an herbaceous mix of spearmint, lemongrass and basil. A dry down of subtle woods make EMPOWER clean, contemporary and incredibly all natural." 10% of the net sale will benefit Guiding Eyes for the Blind. 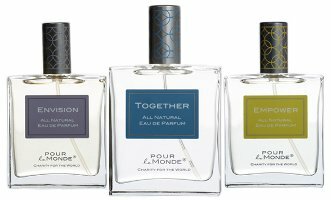 Pour Le Monde Envision, Together and Empower are available in 50 ml Eau de Parfum, $95 each, at the Pour Le Monde website. All of those sound amazing! Empower sounds like the one I would like the best. And knowing that part of the proceeds goes towards a worthy cause makes it all the more appealing. Oh, thanks Robin. I appreciate that. Their Noble Rose of Afghanistan is quite good — smells natural and spicy.